The NuVue Pest Guard is a pesticide free pest solution providing protection to plants and vegetables from hungry deer, birds and other small rodents. Easily pops open and stows away when not in use. Size is 52" Wide X 54" High and comes complete with 4 ground spikes to secure to the ground. This Wind Movement 3-D Coyote Replica is a full-size, life-like replica of a menacing predator. It helps rid your property of Canadian geese, birds, and other small animals. It works without chemicals for a safe, humane and effective deterrent, and its 3-dimensional design provides 360-degree coverage that is visible from any angle. Scare geese and other waterbirds with a realistic, floating alligator head. Mirrored-back eyes flash in the sun as the Gator floats all around the pond or lake. Geese are intimidated by this natural predator. Effective goose control worldwide even where alligators don't live as fear is instinctive. Coverage: up to one quarter acre. Repels geese, ducks, fish-eating birds, small animals. Uses: ponds, pools, Koi ponds, golf courses, lakes, fish or shrimp farms, park districts, condominium complexes, and more. The best-selling Yard Gard humanely and effectively deters pests, including squirrels, raccoons, rabbits, deer, stray cats, skunks, and other small animals with ultrasonic frequencies. This maintenance-free device keeps animals away from your property without the use of messy, dangerous chemicals. The frequencies on this unit have been altered slightly to conform to Canadian ultrasound regulatory requirements. The fearsome Peregrine Falcon feeds on smaller birds, including pigeons, gulls, sparrows, swallows, and starlings. Falcons are found worldwide and attack with terrifying dives at speeds up to 200 mph, tearing into the victim bird with lethal sharp beak and talons. High-visibility scare strikes instant terror. Pest Guard 52-inch The NuVue Pest Guard is a pesticide free pest solution providing protection to plants and vegetables from hungry deer, birds and other small rodents. Easily pops open and stows away when not in use. Size is 52" Wide X 54" High and comes complete with 4 ground spikes to secure to the ground. Pest Guard 52-inch is rated 3.6 out of 5 by 7. Rated 1 out of 5 by Rivan from While taking the item out of the bag it sprung so hard it broke the plastic tubes securing the en... While taking the item out of the bag it sprung so hard it broke the plastic tubes securing the ends together. 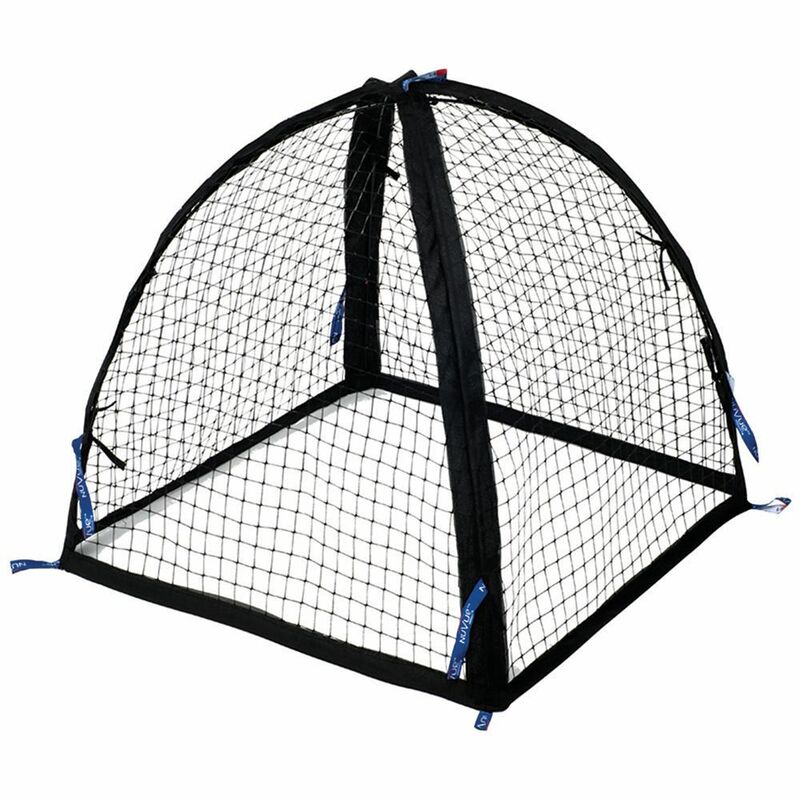 The mesh is simple plastic and did not appear to be strong enough to deter a determined animal. Returned to store to. Rated 4 out of 5 by Maria from Would have given 5 stars, if it had an attached... Would have given 5 stars, if it had an attached bottom and a small opening, so I can pick out produce, with out lifting the whole thing up. Rated 5 out of 5 by Kp from Perfect solution. Bought several and work as advertised. Easy to... Perfect solution. Bought several and work as advertised. Easy to store when not in use. Rated 5 out of 5 by JAinVA from This has worked great so far. It fits perfectly over a 4ft square Greenes raised bed (without the... This has worked great so far. It fits perfectly over a 4ft square Greenes raised bed (without the caps on the corner pieces). It has withstood high winds and heavy rain, without even anchoring it -- the contact with the corners of the bed suffices. And it has kept out the squirrels so far -- tomatoes are showing up on the stalks and are not being snagged by the critters. Best solution I've found, glad I ran into these. Rated 1 out of 5 by Chantel from I purchased the product to keep out the mice and squirrels that were getting into my garden and e... I purchased the product to keep out the mice and squirrels that were getting into my garden and eating all of my fruits and vegetable. It effectively kept out the mice,however, the squirrels were able to cut multiple holes through the material to get in. I'd block one hole and they would make two more. Completely useless. Rated 4 out of 5 by BarbaraLMM from Nice Berry Bush Cover Had a little trouble assembling, but it fits nicely over my blueberry bush. My only disappointment is that there is not opening to pick the berries. The stakes must be pulled from the ground and the netting removed.